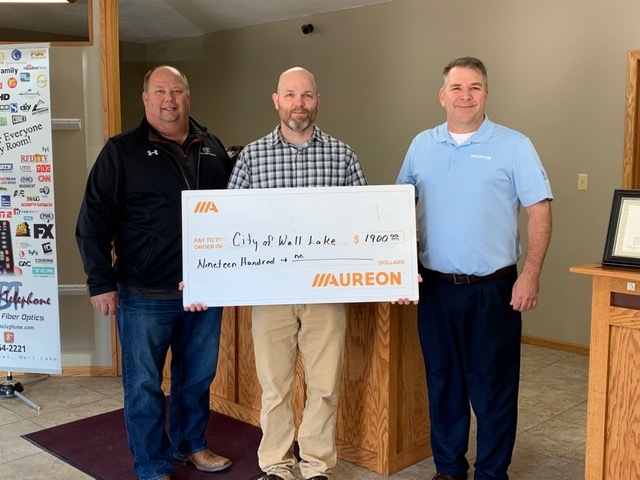 Aureon and Corn Belt Telephone were proud to present three grants totaling $1900.00 to the City of Wall Lake on Friday, March 18th, 2019. $1400 will be used for bunker gear for the Wall Lake Fire Department, $250 for a swing at the park and $250 toward a storage building at the Wall Lake Shelter House. Aureon and Corn Belt Telephone Company are committed to advancing Iowan communities and recognize the City of Wall Lake for their passion for the betterment of their neighborhood. Pictured left to right: Lee Wuebker, General Manager of Corn Belt Telephone Company, Chris Rodman of the City of Wall Lake, and J.D. Siebert of Aureon.